On the season 3 finale of Happy Endings, Jane must plan her older sister's wedding while Brad must deal with her fiance and Alex and Dave keep a secret from the rest of the group. "Deuce Babylove 2: Electronic BabyDeuce"
Penny's mom and Dave's dad have not only been dating but they reveal they are thinking of adopting a child together on Happy Endings. When Max's former roommate returns looking for revenge, he quickly realizes that Max's life is so pathetic it isn't worth it on Happy Endings. "The Ballad of Lon Sarofsky"
Brad and Jane become the proverbial disapproving parents when Penny begins dating the car czar after her breakup with Pete on Happy Endings. The group is worried about Penny when she writes a play titled "Black Plague: A Love Story" after her breakup with Pete on Happy Endings. Penny's move shocks the group when game night at Brad and Jane's gets way too competitive on Happy Endings. Jane is the skeptic and Alex offers encouragement when Penny reaches out to her father before her wedding day on Happy Endings. A war emerges when Jane and Alex's hairdresser shares some gossip about the two with Max on Happy Endings. "In the Heat of Noche"
Brad uses all of his resources to save Chuckles and Huggs while Penny and Max try to break their texting habit on Happy Endings. On Happy Endings, Jane drags the whole gang to a wedding exposition in order to get Pete to change his mind about eloping with Penny. Max swears revenge on his friends when they prank him into thinking he's won a lottery jackpot on Happy Endings. On Happy Endings, Brad is shocked to find out that Ryan is female when Jane's ex comes for a visit. On Happy Endings, Jane and Alex got head to head as they sponsor different teams in a community kickball tournament. 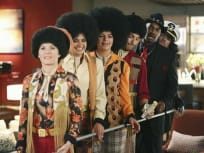 When Penny helps Alex get some publicity, perhaps it won't be the opportunity they hope while Jane and Derrick help Max with an identity crisis on Happy Endings. Brad and Penny find nothing but trouble when breaking a momento from Alex's ends up having dire consequences for her parrot. Then, Dave and Jane attempt to find a love match for Max on Happy Endings. On Happy Endings, when the gang discovers that Jane has been lying about her birthday they throw her the birthday bash she's always wanted. Jane tries to find a joke to make her humorless father finally laugh while Max looks for a new best friend to replace Penny on Happy Endings. "P & P Romance Factory"
Penny attempts to hide her prescription helmet she must wear from her new love interest and Max and Dave experience painful memories over fist bumping issues on Happy Endings. On Happy Endings, Dave wants the gang to experience Thanksgiving with part of his Navajo heritage and may have gone overboard. Meanwhile, the gang remembers how they met 10 years ago. Max invites Brad to help him as an emcee doing Bar Mitzvah's but their partnership may not turn out to be Kosher on Happy Endings. Dave and Alex's real estate agent faces the ultimate challenge when the couple searches for the perfect apartment and Jane takes negotiating to the extreme when she helps Penny find a new car on Happy Endings. On the season premiere of Happy Endings, Alex and Dan they're keeping their relationship "cazsh" while Max slows down Penny's recovery when he develops a crush on her physical therapist. Man I love the workplace, fluorescent lighting, stale coffee and the sweet sound of men quoting classic comedies. It's like a slinky with breasts. Permalink: It's like a slinky with breasts.